In the year 2002, Michael Crichton wrote Prey, a science fiction novel in which a corporation manufactures, in a secret facility in the middle of the desert of Nevada, a swarm of nanorobots with autonomy and the capacity to self-organize. It’s a work of fiction that today has acquired premonitory overtones in view of the latest research and advances in the field of robotics. 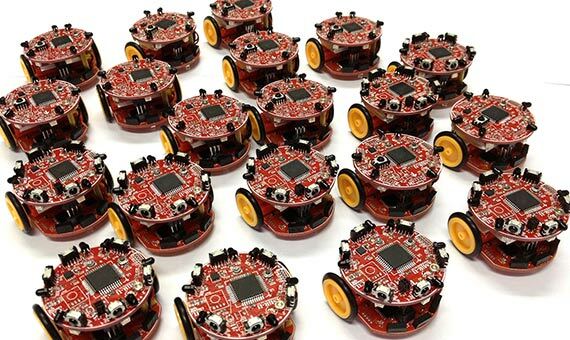 Some teams, such as a group of engineers from Cornell University, have begun to design and program minirobots to behave like a swarm of autonomous insects. Those who have read Prey will find some of these latest achievements in robotic technology, and the scenario they seem to be leading to, both familiar and disconcerting. Vicente Matellán Olivera, from the Robotics Group of the Department of Mechanical, Computer and Aerospace Engineering at the University of León, has made an analysis for OpenMind that reflects the parallels between Michael Crichton’s fiction and the present-day reality. As in the book, several robotic groups from around the world are currently working on the development of swarms: groups of small robots that behave and interact like a swarm of insects. 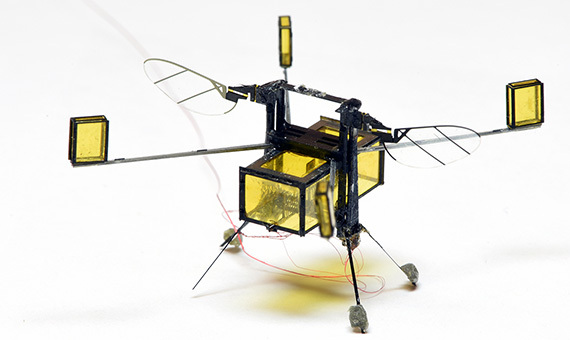 A team of engineers from the Harvard Microrobotics Laboratory is working towards this goal and has created the “RoboBee.” Shown to the public in 2013, the first version of this tiny insect-inspired flying robot weighed only 80 milligrams and had a 3 cm wingspan. It was equipped with vision and motion sensors and depended on a central power source. However, at the end of 2017 the next generation was unveiled—the hybrid RoboBee—weighing 175 mg, capable of autonomously flying and navigating underwater, and incorporating electrolytic plates that convert water into oxyhydrogen, which acts as a fuel. The goal of its creators is that in the near future these RoboBees will be able to carry out reconnaissance, search and rescue missions, as well as environmental monitoring. “The technical definition of emergent behavior was behavior that occurred in a group but was not programmed into any member of the group. Emergent behavior could occur in any population, including a computer population. Or a robot population. Or a nanoswarm. The goal of the Laboratory for Intelligent Systems and Controls (LISC) at Cornell University is to develop programming systems so that robots exhibit behaviour similar to that of living beings, i.e. that they are able to adapt in real time through experience and to organize and interact with each other. LISC focuses on the development and evolution of so-called neuromorphic chips, which instead of processing binary code, process the pulses transmitted by an electrical signal, similar to the signal by which neuronal communication is established in the brain. “In swarms of insects or flocks of birds there is a very small set of rules that produce the impression of intelligent behaviour. The experiments with swarms of robots move in that direction: researchers are testing the rules of self-organisation inspired by biology, which are very efficient for exploring the environment, navigating, etc. Additionally, if a robot is damaged or fails, the rest are reconfigured based on those simple rules,” explains Matellán. Finally, there are initiatives such as Robotarium, the robot terrarium from the Georgia Institute of Technology (USA). It is a robotic laboratory housing a swarm of dozens of small robots that can be controlled remotely and that has been made available to everyone. Anyone can submit their project on the university website and, if approved, put it to the test by writing their own programming code to study how the robotic swarm behaves. The question inevitably arises: will current research in robotics lead to an outcome similar to that of the novel? (Spoiler alert) In the plot of the book, the uncontrollable swarm of nanorobots turns against its creators, forcing an intervention by the army in order to contain it.